Alright, you’ve seen Jordan Peele’s “Us,” and all you want to do is call your friends and dissect every detail and plot point. We’re here to help and to take you through some of the theories that have been floated on the world wide web since its debut. There’s so much to comb through in this film, from obvious imagery to not-so-blatant thematic explorations. Of course, writer and director Peele wants to point out the two sides to our personalities, that we often have an animalistic side that we can’t always push down. “Us” stars Lupita Nyong’o, Winston Duke, Elisabeth Moss, Shahadi Wright Joseph and Alex Evans. It follows a family that goes to their vacation house in Santa Cruz to discover they are being confronted by their doppelgängers — and madness ensues. Once again, these are all just theories. Everyone might have their own, so feel free to jot them down in the comments below. Many fans walking out of the theater were wondering about the significance of the rabbits in the tunnels. There are a couple of explanations: mainly, rabbits are associated with mass breeding. For people living underground, that would mean they would have a good, continuous source of food. After all, Nyongo’s “Red” says The Tethered feed on them, mostly raw. Also, rabbits have become synonymous with experimentation — in the film, the government tried to clone people but soon halted the experiment after they realized they could only clone bodies, not souls. According to The Ringer, rabbits have also had many roles in cinema. In “Bambi,” for example, a rabbit symbolizes good, while in “Donnie Darko,” the rabbit means pure hostility. Reddit users have gone absolutely crazy with the idea of duality. One fan mentioned the Rorschach test, where inkblots are presented to a subject and their responses are analyzed through psychological interpretation. In the trailer, inkblots are part of the credits, which begin the idea of duality for the whole film. There are always two identical halves that make up a whole. Speaking of scissors — why did Peele choose this particular tool as the terrifying murder weapon? The director himself explain the literal duality of scissors in a movie where people are being attacked by themselves. “There’s a duality to scissors — a whole made up of two parts but also they lie in this territory between the mundane and the absolutely terrifying,” he told Entertainment Weekly. Many fans have theorized about the theme of social inequality in the film, as well. Reddit user Rydizzle234 said he thought the movie was about exactly that because the “shadow” figure represented those who were born less privileged. He explained that throughout the movie, The Tethered expressed how they had struggled in their lives, wishing they led a better version that was handed to the people above. He specifically pointed out when Abraham took Gabe’s glasses and placed them on his own face, and Elisabeth Moss’ doppelgänger applied lipstick to herself in the mirror. The Reddit user also pointed out that Adelaide’s “Red” was chosen to lead the group because she was different and she could break the barrier between the world and what lies beneath, once again hinting to the rich and the poor. Plus, the appearance of The Tethered referred to maybe less access to health care and just general hygiene, once again a reference to social inequality. We posted a whole article on the meaning of the Bible verse “Jeremiah 11:11,” which you can read here. But if you watch closely, you will see many references to that particular number throughout the film. When Gabe is watching baseball, the announcer says “we’re tied at 11:11” (once again, “tied” plays into the duality theme in the movie). The clock reads 11:11 in Adelaide’s bedroom. And how many times have you heard the saying, “11:11, make a wish!” when the clock displays that time? There’s a superstition that that particular time grants our deepest wishes. This is one of the more far-fetched theories, but still worth mentioning. Some fans believe Jason and his doppelgänger also switched places, and most of it is credited to the magic trick he can’t seem to nail. For some reason, he can’t do his lighter trick anymore, although he used to be able to. Meanwhile, his Tethered’s face is burned. However, this could also mean that the magic trick wasn’t working in the above world, but in the tunnels, every time Jason tried to do the trick, it worked and actually burned his Tethered’s face. Also Read: Jordan Peele's 'Us': Are There Really Thousand of Miles of Hidden Tunnels All Across the Country? Another reason why people believe they actually switched places is because Jason doesn’t build a sandcastle at the beach, but actually builds a tunnel. Why? “At the end, he has realized that his mother, at one point, has also switched bodies. She gives him a look almost like ‘I also know what you know’ and then he puts on his mask, as a symbol of the masks they will now wear for the rest of their lives,” wrote the user. SlashFilm pointed out that the film comments on the “haves and have-nots” of our society. There is always someone who has more than us. The Wilsons are doing fine financially — they have a summer house at the beach, and Gabe buys a boat. But their friends, the Tylers, have a nicer boat, a nicer house, etc. This also applies to The Tethered, who are the ultimate “have-nots.” They don’t have anything the Wilsons have, and aspire to have what their clones above have. They spend years trying to come up with a plan to take what they’ve been deprived of. It seems like Peele was trying to make another social statement with this one. Maybe less of a theory, but something to point out — have you guys noticed Adelaide’s white shirt gets more and more red throughout the movie as blood gets on it? 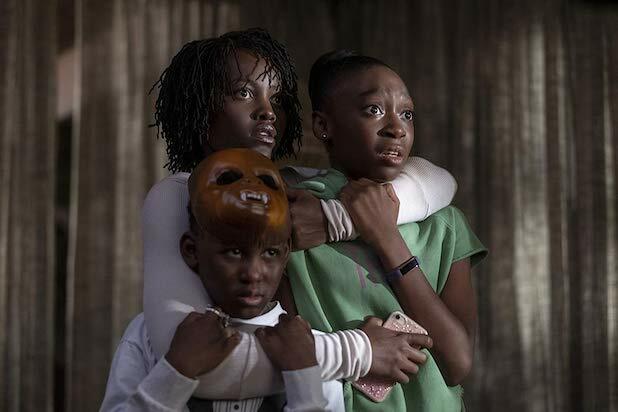 Does Jordan Peele’s ‘Us’ Have a Post-Credits Scene?